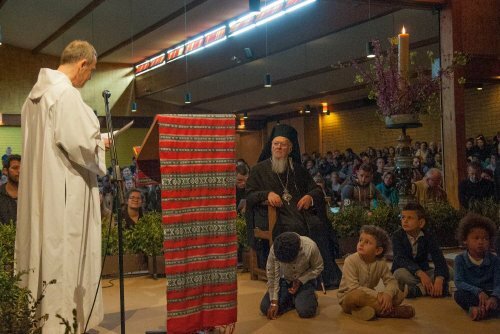 On Tuesday 25 April 2017, His Holiness the Ecumenical Patriarch Bartholomew visited Taizé: an exceptional visit with the brothers, several Orthodox bishops and priests, representatives of the local Churches, and the young people present that week in Taizé. Here are the complete texts spoken by Brother Alois and Patriarch Bartholomew during the midday prayer. Your Holiness, Beloved Patriarch Bartholomew, by coming to our hill of Taizé you cause in us an extraordinary joy, since we are so attached to the Orthodox Church. Since its origins, our community has been imbued with the Orthodox tradition. The centrality given to the resurrection of Christ and the role of the Holy Spirit, the strong reference to the teaching of the Church Fathers, the liturgical life, the contemplative life maintained by monasticism, the icons, the courage to go through decades of suffering across past centuries, all these values lived in the East have been and remain for us, the brothers of Taizé, unique sources of inspiration. For years now, young Orthodox from various countries have come to participate in the weeks of meetings that succeed one another around our community. Their mere presence raises the question in the young Christians of the West whom they meet here: how can we receive and share to a greater extent the gifts deposited by God in the soul of Orthodox Christians? Most Holy Father, I am sure that your venerable predecessor, the Patriarch of Constantinople Athenagoras, and the founder of our community, Brother Roger, are looking down at us and rejoicing with one heart. During their life on earth, a deep mutual trust enabled them to promote in 1962 the creation of an Orthodox monastic center in Taizé which was animated by the beloved Archimandrite Damaskinos, future Metropolitan of Switzerland, until he moved to Chambésy and set up the center whose fiftieth anniversary you have just celebrated. Venerable Patriarch, I can not forget the warm welcome that you gave me and some of my brothers at Christmas 2005. Your affection supported our community, which was then undergoing a trial on account of the very recent violent death of its founder. Your welcome was just as warm when, a few years later, with a hundred young people from twenty-five countries, we went on pilgrimage to you. Today we are the ones who welcome you with love and express our admiration. During your long ministry as patriarch, you have tirelessly worked for more than 25 years to make the treasures of the Orthodox faith relevant to the contemporary world. You have raised your voice in favor of an earth where all can live; you constantly recall that our relationships to creatures should reflect our relationship to the Creator. Your aspiration for Christian unity, your openness to interreligious dialogue and your experience of a crucified Church make you an irreplaceable witness to the peace of Christ. And now we will sing and praise God, then we will listen to you, and you will bless two icons. Following this we will go to the small Orthodox chapel adjoining this Church of Reconciliation and then to the tomb of Brother Roger. We are touched and honored that, after that, you will share the fraternal meal of our community. Thank you, beloved Patriarch, for being like a Father in faith for us.